I’ll never forget the eerie sensation of entering our hallway for the first time. It was shadowy, hushed, and gave the impression that no one had stepped foot within it for a hundred years. My eye was drawn up, mesmerised, to the high, ornate ceilings and carvings, and then to the spacious rooms lying beyond, crammed full of antique furniture. It felt so much like being inside an old National Trust property that I half expected to find a time-worn, frayed red velvet rope guarding me from entering the living room. When we came back on moving day during broad daylight, the hallway had been stripped of its furniture and pictures, and felt like…. a normal space. With a really dreadful blue carpet. But I’ll never forget that ghostly feeling of walking into our house for the first time, and sensing the presence of all the people who had passed there before us over the previous 145 years. We lived with the hallway in the state we inherited it for a really long time. 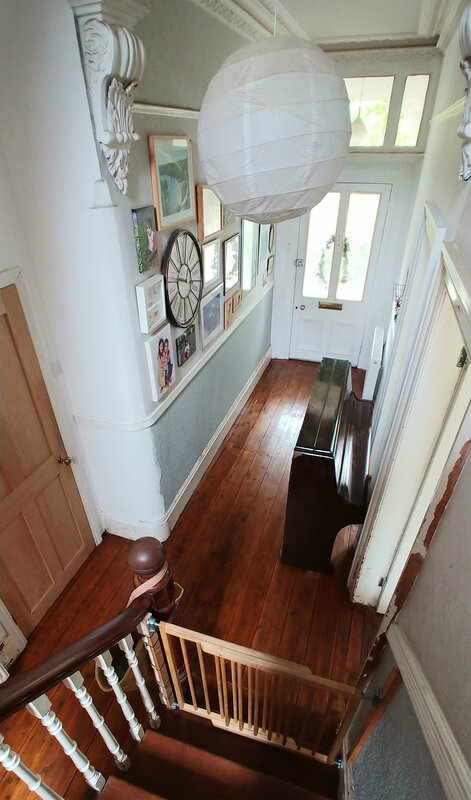 Our new next door neighbours told us that they painted their hallway as soon as they moved in, and found it made a massive difference to how pleasant the house felt, despite the rest of the rooms being a bit of a state. It’s great advice for sure, but we didn’t take it because we couldn’t justify the time and expense on a room that is used for nothing more than passing through on your way to the other rooms, not when the bedrooms were hideous and full of dust, the bathrooms were grim, and the kitchen was the size of a shoebox. After a few years, we renovated the staircase. We ripped the carpet off, carefully soaked the lead paint off the treads and risers, sanded everything, and then used Osmo oil to create a gorgeous warm finish on the old wood. 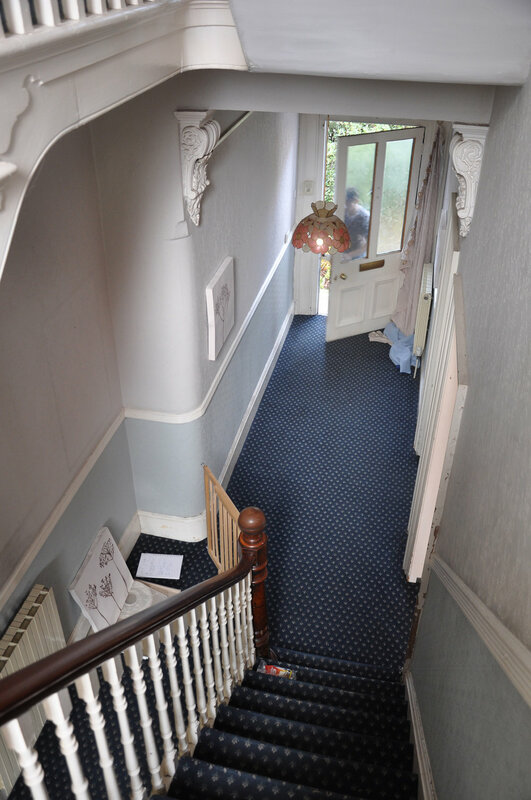 The original view from the front door through to the kitchen. A couple of years after that, we finally got the builders in to build our extension. 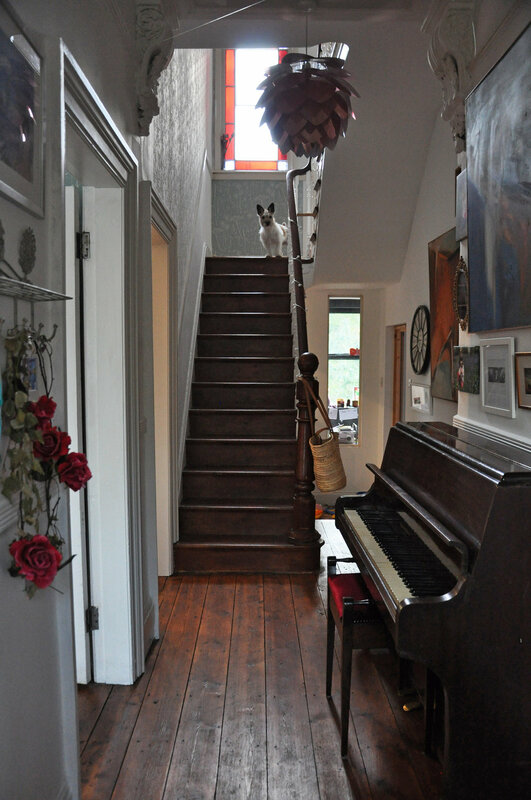 As they were doing extensive work on the rooms to the right of the staircase, they built a massive floor-to-ceiling chipboard partition to protect the rest of the house from the dust. You can see the chipboard partition on the right, sealed with insulation foam. And taking it down again a few months later. Instead of the view through to the kitchen, we now have a new internal wall with a window through to the playroom beyond, and the garden. Earlier this year, we took the carpets up on the floor, and did a light sand on the floor to get off the worst of the dirt. What’s this? 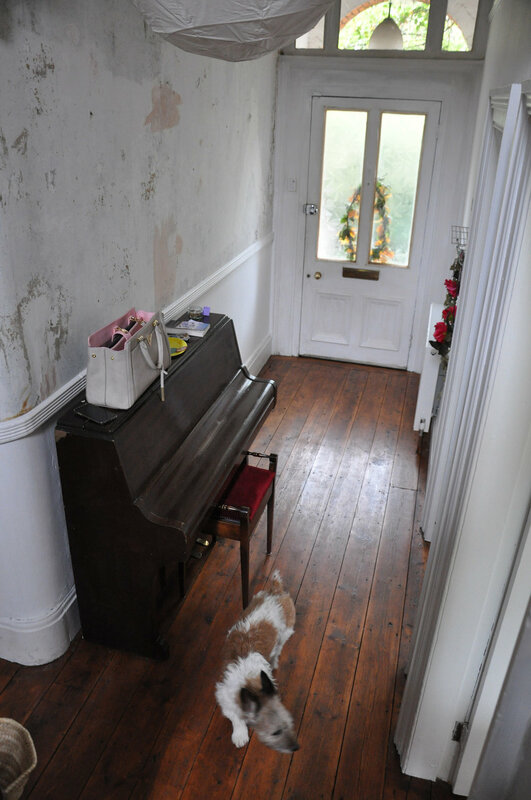 Oh, just an enormously heavy free piano being carried into the house by my husband and his mates. The poor lads thought they were coming over for a beer, they should know us better than that by now. 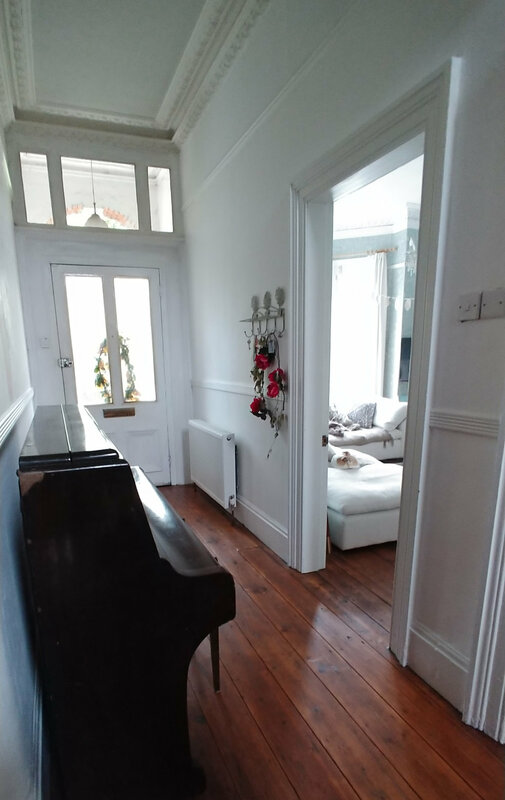 When the universe throws you a free piano, you naturally wheel it through the streets comedy style (to me, to you), and then wrestle it up your stairs into your house and abandon it permanently in the hallway cos it’s too damn heavy to move any further. 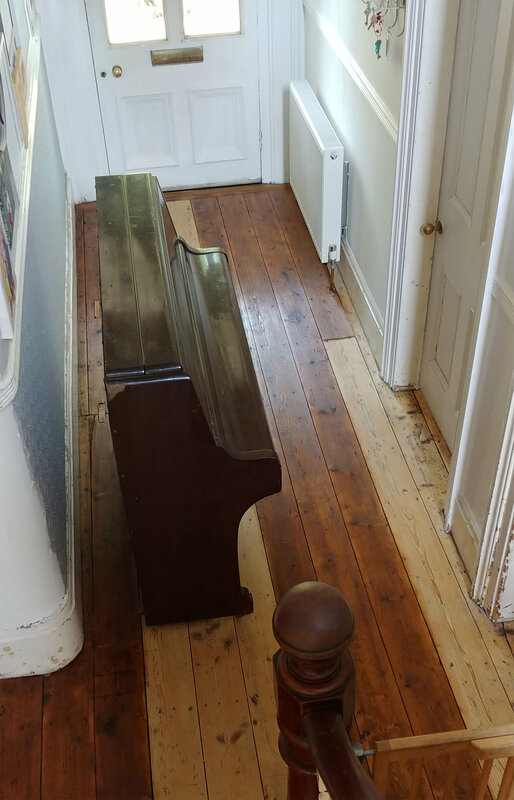 Ideally we should have finished sanding and then oiling the floor before the piano became part of our lives, but you can’t always control the timing of the opportunity to acquire an item of furniture as brutally heavy as it is magnificent. Oiling underneath the piano. You can also see the new boot room on the left, created by nicking part of the old dining room, and opening up a new doorway from the hall. 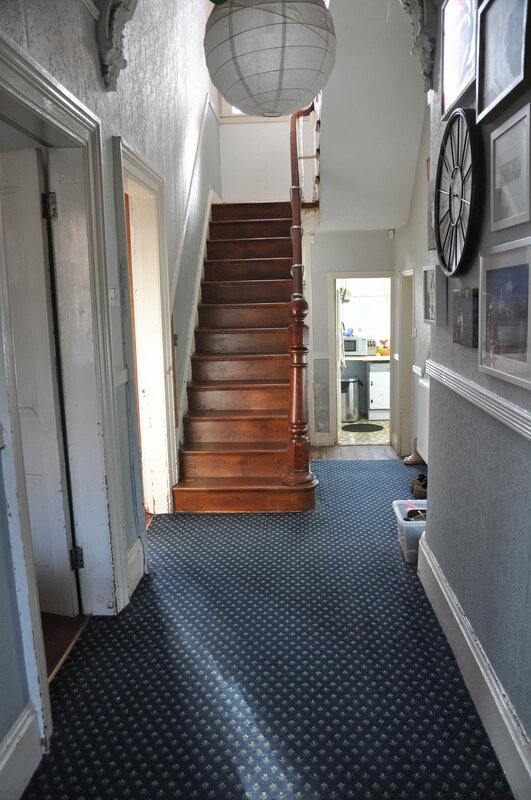 A few weeks ago, we embarked up the final stages - taking the wallpaper off, painting the walls, and priming and painting the architrave, dado rail, picture rail, doors, skirting board, spindles, and the decorative panelling on the sides of the stairs. And it didn’t. Hello, bright pink front door and lovely colourful artwork. I took these photos on a dark, gloomy day - on a sunny day it looks more like the pictures above. Doing my best impression of the portrait on the wall behind me. The view when you enter the house. And a reminder of how it looked on day one…. We executed this project on a massive budget. We didn’t bother to replaster as the walls weren’t in terrible nick underneath the wallpaper, and I knew we’d be covering them in artwork anyway. 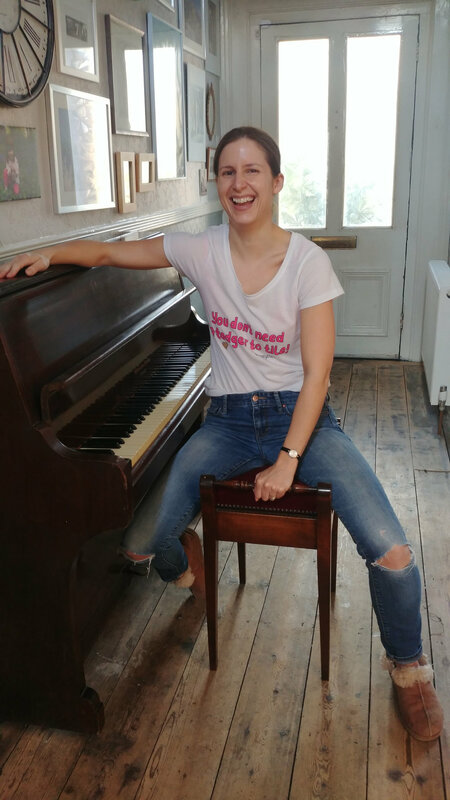 So we used a big tub of cheap white emulsion, a few tins of Zinsser primer and Dulux ‘White Cotton’ satinwood paint, leftover Osmo floor oil from other projects, leftover pink paint from the bath, a free piano, and all the artwork we’ve collected over the years. We own a wallpaper stripper, and a floor sander. So the total cost to us was under £50, but if you needed to buy all the products and hire the tools, then you’d be looking at maybe around £200, which is still a decent price for a large room.